There has been a change of management with the 1st and Reserve teams this week. Following training on Tuesday evening first team manager Ronnie Williams has left the club with immediate effect, Brad Chalmers who was assisting Ronnie in a coaching role has also left the club and has joined Milton United FC. 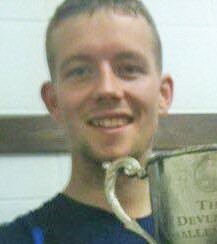 Luke Cuff (pictured) becomes joint manager alongside Reserve team manager Matthew Jacob, with Richard Hathaway and Steve Skyrme becoming joint managers of the Reserves. The club would like to thank Ronnie and Brad for everything they have done at the club and wish them both well for the future. The management team can now concentrate on maintaining the teams fine form so far this season, with both teams still in contention to win the treble.  RESERVES REACH COUNTY CUP FINAL The Reserves have reached the final of the OFA Intermediate Cup after a 4-1 win against Watlington Town FC. Club pays tribute to both club and League stalwarts  Players from both the junior and senior teams pay their respects to club and league stalwarts.